Valve and the Team Fortress 2 Announcer do not take kindly to unscrupulous behavior. 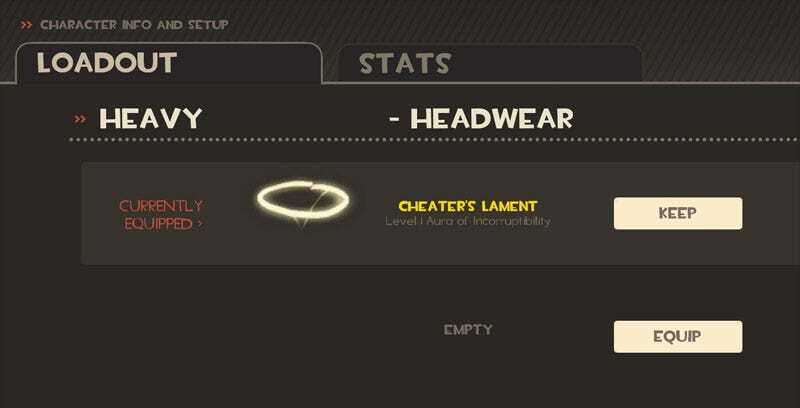 That's why nefarious TF2 players who cheated their way toward securing unlockable hatwear will be stripped of those items. The good guys, however, will be blessed. As noted on the official Team Fortress 2 blog, any player who employed a third-party idling application to obtain unlockables will lose those items over the next few days. That's less than 5% of players, fortunately. The other 95% or so, they'll get halos, as seen above. Valve's Erik Johnson writes that the developer will "adopt a zero tolerance policy for external applications used to manipulate the persistent item system," something fans of collecting virtual items would be wise to adhere to. Reader Harken was nice enough to send in screen shots of his Cheater's Lament headwear, granting him a level 1 aura of incorruptibility. He also forwarded us the halo in action, sitting atop a very proud but incorruptible Pyro.